I just finished playing Batman: Arkham City. The second Batman game created by sudden gaming powerhouse Rocksteady Studios. It’s a great adventure that stays true to the source material that made the Dark Knight such a timeless character in the first place, nary a thug on ice-skates to be found. In the previous game Batman had to infiltrate Arkham Asylum, the mental institute for the criminally insane (with the worst turnover rate ever) to foil the Joker’s nefarious scheme. This time in what may be the weakest plot explanation ever, downtown Gotham City has been cordoned off and turned into what is basically: Crime City. It is a bleakly crafted gothic industrial nightmare world in the dead of winter rife with murders on every street corner. Now all the supervillians can hatch plots against each other and busy themselves with turf wars instead of doing something constructive like say: banding together into the most powerful criminal organization in comic history and collectively taking control of Arkham City. 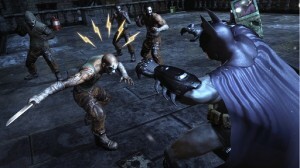 The combat of Batman: Arkham Asylum is an excellent example of tightly honed controls and a massive development budget. Batman has a seemingly endless array of brutal counter attacks that are unleashed every time you press a button while an icon is superimposed hovering over a thugs head. 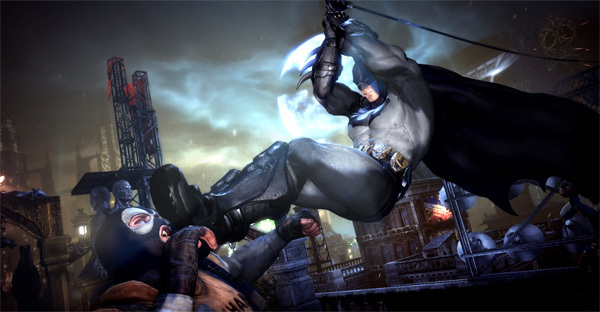 It’s exciting to find yourself tackling a foe and suddenly Batman decides to grab the thug by the scruff of his neck and slam his face into the nearby railing rather than simply throwing another of the dozens of punches it takes to place an enemy in a state ready to be then knocked out. Press counterattack now, now, now and now. Once they are stunned and lying prone you can leap onto them and perform a “finisher” move which permanently incapacitates them. Unless you dole out an excessive amount of damage to a foe (knocking them down several times only to have them leap back to their feet ready to go a few seconds later) you will need to perform this same lunge and slow motion head slam countless times during your play through. If you are struck by any other enemy during this lengthy process it breaks the animation and gives the grounded thug a free pass, and there will always an enemy winding up for an attack. It does add a layer of strategy to your fights but it also makes them artificially long. I found myself on multiple occasions fighting the same cluster of enemies for minutes at a time, my mind would just wander off as Batman performed stunning combat acrobatics while pulverizing foes all with the push of one button intermittently. It became simply too routinely unsuccessful to try and use a finisher on a thug before another intervened that I finally just concentrated on beating them through a war of attrition. The best addition to this entry in the “Arkham series” is easily your new glide abilities. Early on you learn the ability to Dive Bomb. Batman dives towards the ground at terminal velocity and uses the momentm to quickly catch the updrafts and give him lift and speed that can carry him about a block aloft using his bat cape. At first it seems like an underwhelming ability, unlike other “flight” mechanics in games like a jetpack or racoon tail, Batman can never get higher then from where he first leapt from. You glide slowly losing altitude at a constant rate. As you approach the street you use your grapple gun just before entering the unseen upper sensing range of the thug packed streets below and latch onto a handy almost always available nearby ledge to scramble up to a higher building so you can leap off with maximum possible range again. Once you get the a hang of it you really do feel like Batman, surmounting buildings with satisfactory speed and impressive grace. One missed opportunity would have been the ability to break away from the “reeling in” portion of your ledge grappling to continue gliding, It seems like such an obvious oversight I would bet we will see it in the yet to be announced butdoubtless sequel. The mechanic is so satisfactory I found myself feeling positively claustrophobic in almost every interior level, namely the supervillans’ hideouts, yearning to finish off the current area so that I could head outside again and practice my aerial sneak attacks. Unlike other rooftop scramblers* like the recent Assassain’s Creed: Revelations, enemies do not have the ability to follow you up to the roofs and continue the chase. I found this to be serendipitous. Batman is a solitary character and he is often depicted perched atop a building in the night looking out solemnly over the city below and Batman: Arkham City does an excellent job of capturing that sense of isolation and of being a silent predator who could leap from the shadows at any moment. You are constantly monitoring local communications so you are regularly treated to an influx of flavorful conversations fleshing out the amoral, remorseless and downright hilarious nature of seemingly every unrehabilitatable criminal on the streets below. 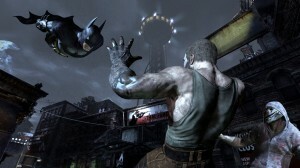 Batman: Arkham City is a worthwhile purchase for any fan of the caped crusader and his motivations still carry weight. When your a billionaire industrialist who witnesses his parents brutal murder as a child the only sensible thing to do is don that cowl. Much of the voice acting comes from veterans of the beloved animated series of the 90s, Batman, Harley Quin and Joker all sound exactly as I expect them to and it makes seeing them interact on screen much more enjoyable than the banter between any of the sizable cast of other super villains, most notably Two Face, Poison Ivy, The Penguin, Mr. Freeze and for old times sake lets group Catwoman in there, though she hasn’t really been a villain onscreen or in print since Michelle Pheiffer’s interpretation. Each one is re-envisioned in a believable and interesting way. Mr. Freeze is especially cool looking. Although their take on Catwoman skews a little juvenile. Why so high? The action is fluid and dynamic, the graphics and world are stunning to behold and placing yourself in the rubber boots of Batman feels satisfing and convincing. * Rooftop Scramblers: Assassin’s Creed, Spiderman, Prototype, inFamous, etc.